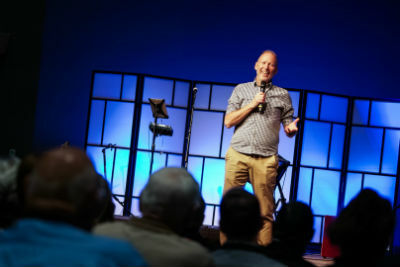 Less than a year out from the Church of God Convention 2019 and General Assembly in Orlando, many Church of God people got their first taste of Florida on Tuesday at the Regional Convention near Tampa. Sunshine, palm trees, and the Bay nearby were certainly sights to behold; more so was the prayerful response at the altar on Tuesday evening. During the day, convention-goers satisfied their cravings at the Melt Machine Food Truck but didn’t linger long, as the air-conditioned space within the walls of Bayside Community Church offered relief from the unseasonably hot and humid weather. Inside they found a diet of Living Water and the Bread of Life to be most refreshing, as anointed messages, inspirational times of worship, engaging conferences, and rich conversation marked the day. About 235 strong gathered in the newly renovated sanctuary of Bayside Community Church on Tuesday for the opening day of the fifth-and-final 2018 Regional Convention of the Church of God. Ben Hardman and Matt Tebbe led another insightful conversation about ministry methods and the way of Jesus. One of the more convicting and compelling moments surrounded the notion that Christian leaders often avoid—whether intentionally or not—leading like Jesus, simply because his methods weren’t always the most efficient. Of course, Jesus was concerned first and foremost about relationships—about the people, not the numbers. Jim Lyon addresses the Safety Harbor Regional crowd on Tuesday. An always-captivating Town Hall with Jim Lyon, a CARE seminar with Joe Cookston and Ryan Harter, and a credentials certification meeting with Jeannette Flynn and Ryan Chapman—welcoming several regions—rounded out the daytime activities. Also coming as no surprise, the evening session was particularly powerful. Photo: Ken Love leads prayer for the Sarasota church plant. Outstanding worship led by the Bayside worship team set the tone well for all that would follow on Tuesday evening. 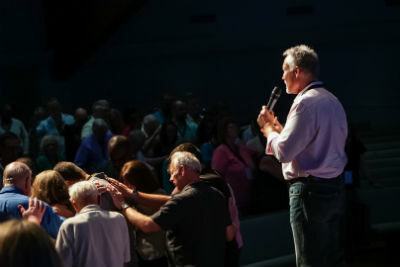 A beautiful moment and prayer of commissioning rallied the saints together as Ken Love introduced the church planting team of the new Church of God in Sarasota, Florida. After a soul-stirring sermon delivered by Jim Lyon, the Spirit prompted pastors and laypeople to move forward and bask in the presence of God. Though the sun had set that day, the light of Christ had shone down on that room, giving pastors renewed hope and vision, laypeople renewed purpose, and everyone a renewed sense of life abundant and free. Sweet fellowship closed the evening as Global Strategy hosted a reception with director Andrew Gale, international missionaries Ernie and Lori Nicholas, and home missionaries Tim and Kim Wardell. For a schedule of events and to see what’s ahead on Wednesday, visit www.chogconvention.org. 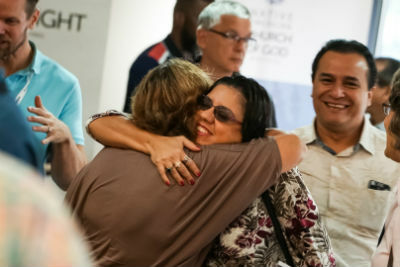 This entry was posted in All Church of God, Church of God Convention, Southeast and tagged 2018 Regionals, altar call, Bayside Church, Bayside Community Church, camp meeting, Campmeeting, Church of God Regional Convention, church plant, Commissioning, FL, Florida, heat, humidity, invitation, Ken Love, prayer, Reeder, Safety Harbor, Sarasota, sunshine, Tampa, Terry Rolen, unity, weather. receptions, worship. Bookmark the permalink.